Hi peeps, good morning! How are you all doing today? Quick post for today. 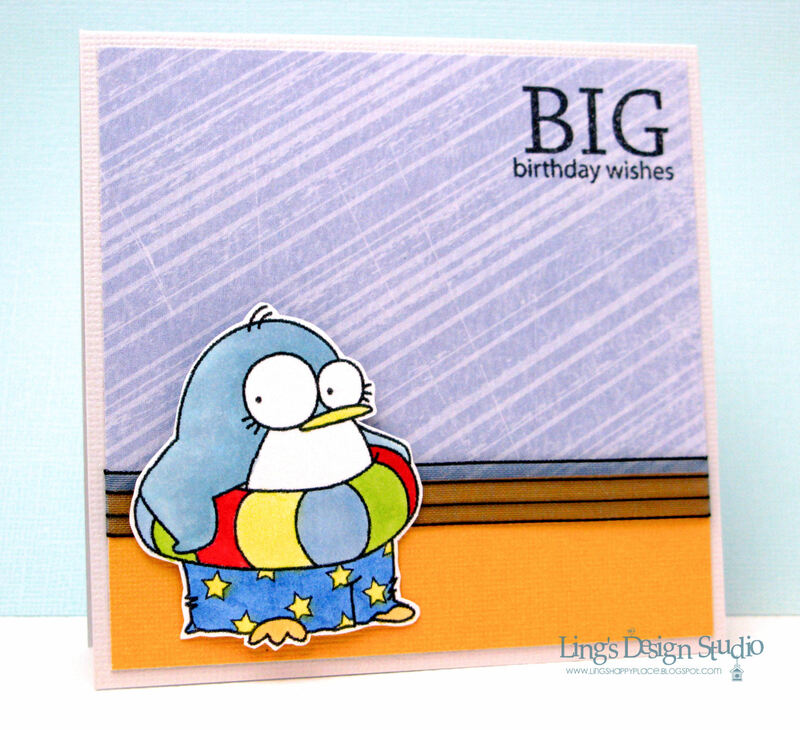 I made this mini card using this cute penguin from Birdie Brown shop by Torico. She has some of the cutest digital stamps. And, in case you didn't see yesterday's post, I have some brand new Penny Black stamps for sale. Simply click on the For Sale tab above. Thanks so much and have a blessed day. 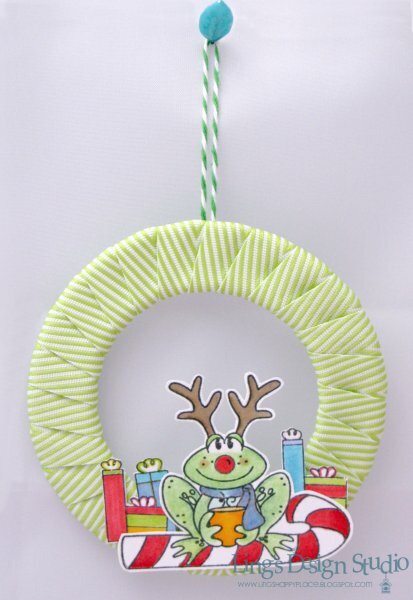 Hi all, since I got laid off a while back, I've been raking my brain to find ways to support my crafting obsession. My MIL has generously offered to help me started my own shop. I want to offer it online as well, but I am still cautiously testing the water. I have some Penny Black stuff available for sale and you can find them under the FOR SALE tab. 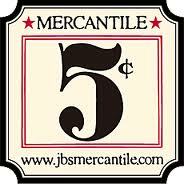 I want to be able to do this where it helps support my hobby and along the way get you better deals as well. I am thinking to offer pre-order option. 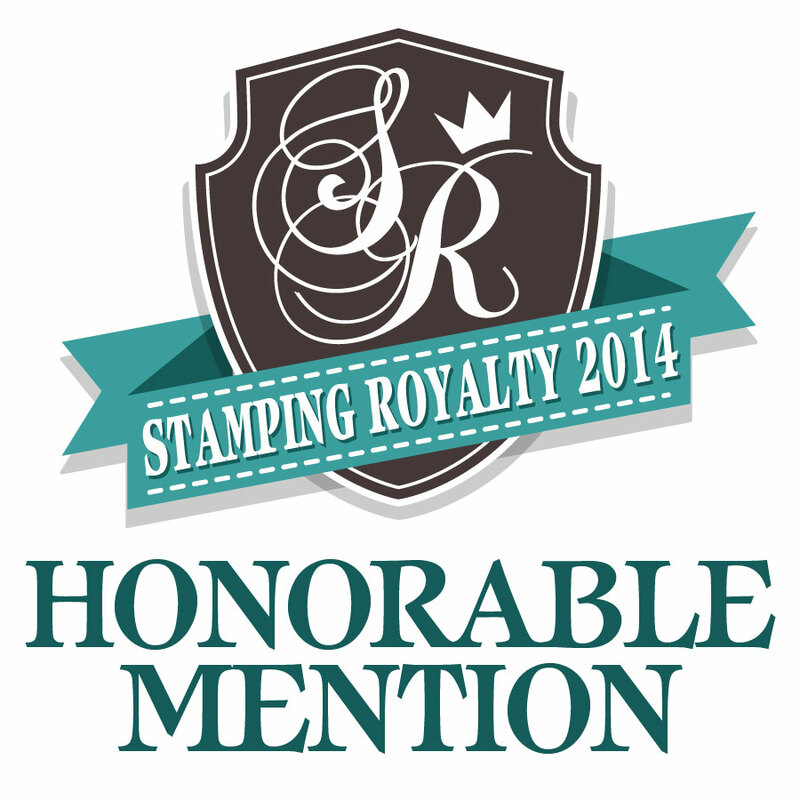 Obviously, right now I don't carry many stamps, but you can find a complete line of Penny Black stamps at their site. Write down the stamps that you are interested to order and if I can get enough people who are interested to order, I will place another order mid of September. For this to work, I will need your commitment though, otherwise I might be stuck with a bunch of stamps. :) If this pre-order works, I will pass on the savings to you. Email me with any question or suggestion. Thanks so much!! Of course, no game would be complete without a prize. 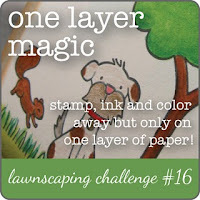 Go check out Lawnscaping blog for details. Some of you say they can spot my card from a mile away. So I want to know, can you spot which one is my card? The game will begin at noon EST. See you there! Happy Saturday peeps! Are you ready for a new challenge? 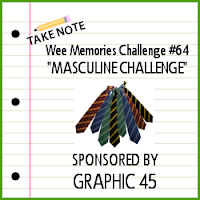 Cause you know it's time for a new Wee Memories challenge. This week the theme of our challenge is "Back To School" and we are sponsored by Your Next Stamp. 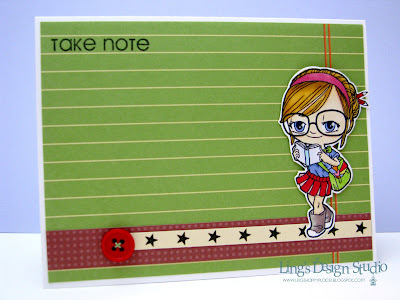 I don't really have school related stamp since I don't have any kids, but luckily I recently got this cute Bookish Tia from Some Odd Girl that is just perfect for this theme. The DT gals have created some fabulous samples for you, so make sure you check them out at Wee Memories blog. This challenge will run for 1 week. From this week on we're back to doing weekly challenge instead of bi-weekly. Hope you will join us and I cannot wait to see what you created! Enjoy your weekend and for those in the East coast please be safe. Hugs. Hi all. 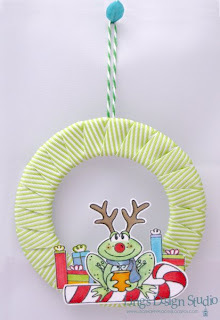 Just a quick post to let you know that I have a Christmas ornament &amp; card tutorial up on May Arts blog. Here's a look at the ornament. 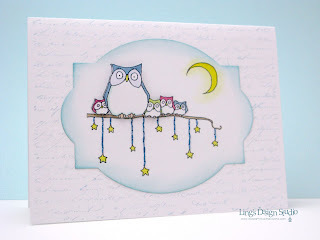 For the card &amp; the tutorial please check out the post HERE and would so love for you to leave some love over there (and you get a chance to win Our Craft Lounge goodies). Hi y'all (can you say it with a Texan's twang?? LOL). Friday means new releases from A Day For Daisies. This week I picked this sweet girl image called "Resting My Broom" and colored her with Copic and Kuretake ZIG Wink of Stella (glitter pens). It's hard to capture the glitters, but I basically outline the eyes, nose, mouth area and the pumpkin itself with a yellow Wink of Stella. So, in real life it has nice glitter to kind of reflect the look of the pumpkin being lighted from the inside. 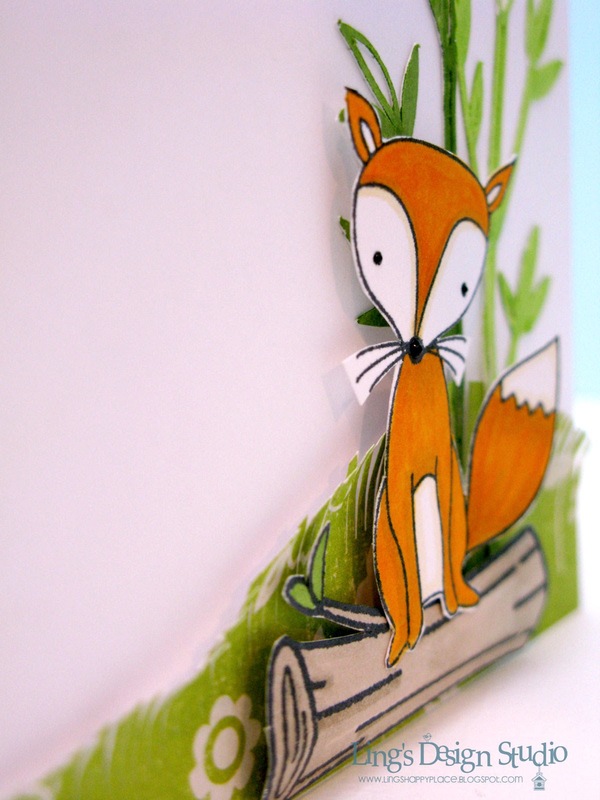 The patterned paper is from Bo Bunny. 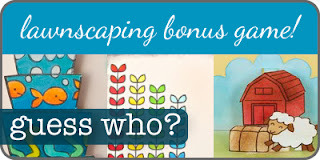 Some Odd Girl has a new challenge for you and this time the theme is paper piecing. I used this lovely Sweet Thinkin' Mae and paper pieced her dress & hair bow using printed Echo Park Playground digital paper set. The fun, bright background also from the same set. The sentiment is from Technique Tuesday. I am totally swamped at the moment. 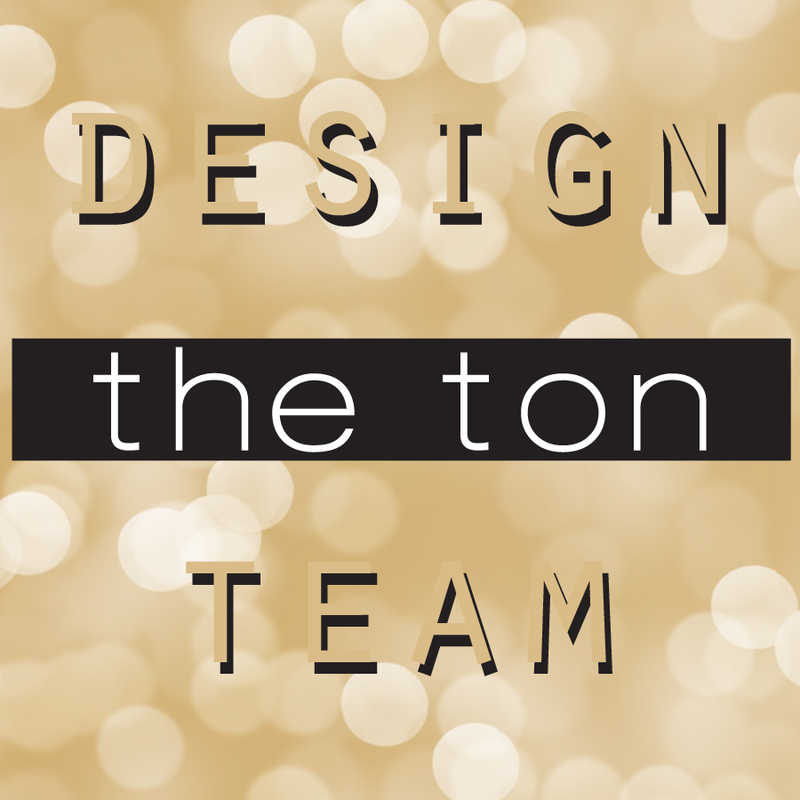 I am busy trying to get all my DT and submission cards done before my upcoming vacation. Hubby finally can take some time off from work and we're going to San Fransisco. Planning to drive down to Monterey and all the way down to Santa Barbara. If you have any suggestion like other city or place along the way that would be great to visit, I'd love to know. 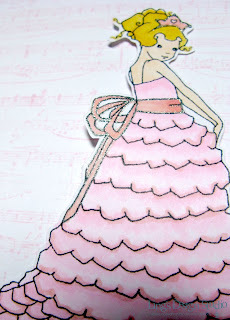 Some Odd Girl DT has fabulous inspirations for this challenge, so make sure you stop by Some Odd Girl blog to see their works and I hope you will join us on this fun challenge. Thank you for stopping by and have a wonderful day! I did sneak in to play last night and I made this card for the current Hero Arts August challenge to use critters or make a scene. 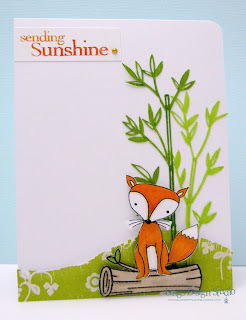 I always love the way bamboo looks and thought it would be fun to create a scene using this Hero Arts bamboo die-cut (available through Silhouette). I simply cut the bamboo on white cardstock and then colored them afterwards. The darker leaves were colored using Faber-Castell big brush and the lighter color one were colored using Copic. 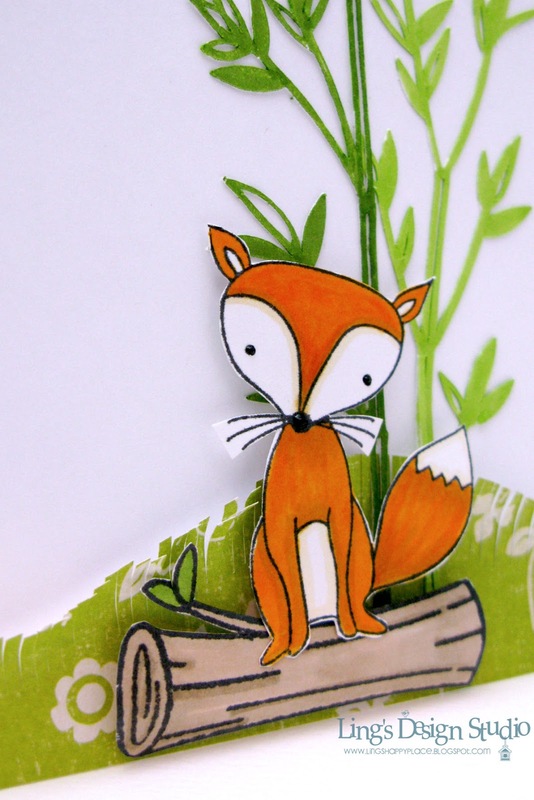 Here's a close-up look of the fox. I don't know if you could really see it, but there's quite a few texture to this card. I curled the tree trunk, so it actually looks kind of round to convey the realistic look of a tree trunk. I also curled the fox body itself and use thick and thin pop-dots to create depth. And the tail is curled up. Added black enamel for the eyes and the nose. Yep, a whole complete set of their twines!! How yummy is that? Go check them out. You can check out all the details of the giveaway at THE TWINERY blog. Good luck!! Yesterday was one of those day. I am tired and frustrated of people who think the only way to be ahead in life is by running over other people. You want to be ahead in life then work hard, use your brain, be kind to others. Be ahead through an honest way, through a way that you can be proud of. Where's the pride of being ahead by being mean to others? There's this story about Budha. He was meditating and this rude person walk by him and call him all kind of names and Budha just smile. Finally, the guy asked him why is he still smiling and not being insulted by the name calling and all. And Budha said, "Because none of them were true and your words have no power over me unless I let it be." Some people are just plain mean and they will do anything and say things about you like this person did to me, just to be ahead. But we have the choice whether to let mean people has power over us or not. If anything, I feel sorry that this person must be so miserable that she feels the need to hurt others just to make herself feel better. I am frustrated by this person act, but you know what... this makes me determine to spread the message that KINDNESS RULES!! Be nice to others and let mean people see that being kind and nice matter more than being mean. Now that I vented off my frustration, let's share some pretty things shall we. Let's surrounded ourselves with good positive energy. 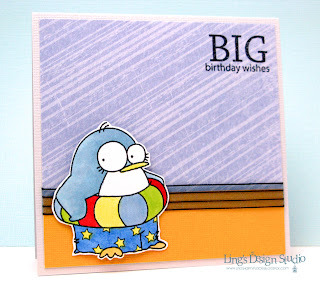 Today, I have a couple cards to share using the new released from A Day For Daisies. 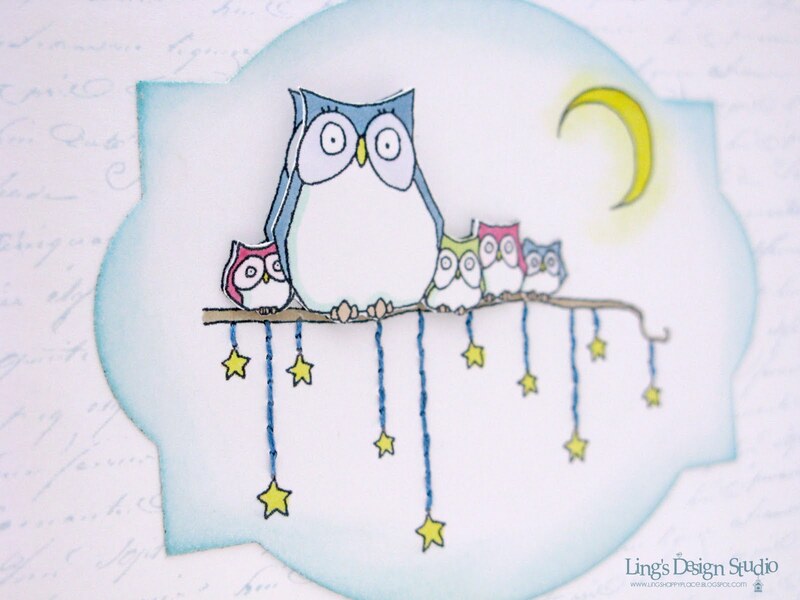 As soon as I saw this cute owls image, I knew I want to use it right away. Love the look of hanging stars and to add texture, I hand-stitched them. Distress the edges of frame with distress ink and for the moon glow, I rub chalks around the moon. The moon itself was colored with copic marker. 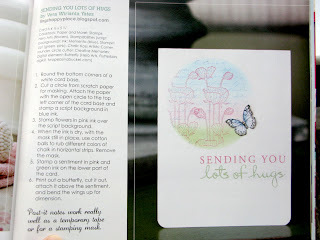 I often mix and match different color medium on a card. Here's a close-up look of the layered image. I outlined the sash with Sakura glitter pen and here's a close up look. Hopefully you can see the pretty soft glitters on the sash. You can click on the pic to get a larger view. Now... I am going to start my days by making someone's day brighter simply by giving them smile. One small act. A smile can trump over a frown. An act of kindness can trump meanness. Let's spread kindness all over the place so meanness have no place in our life. This week started off in such an awesome way for me. Late Monday afternoon UPS knocked on the door and delivered a box full of fabulous stamps from PSA Essentials. Hmm... like 85 stamp sets and plenty of ink pads. I mean, talk about being overwhelmed. This is my DT package. 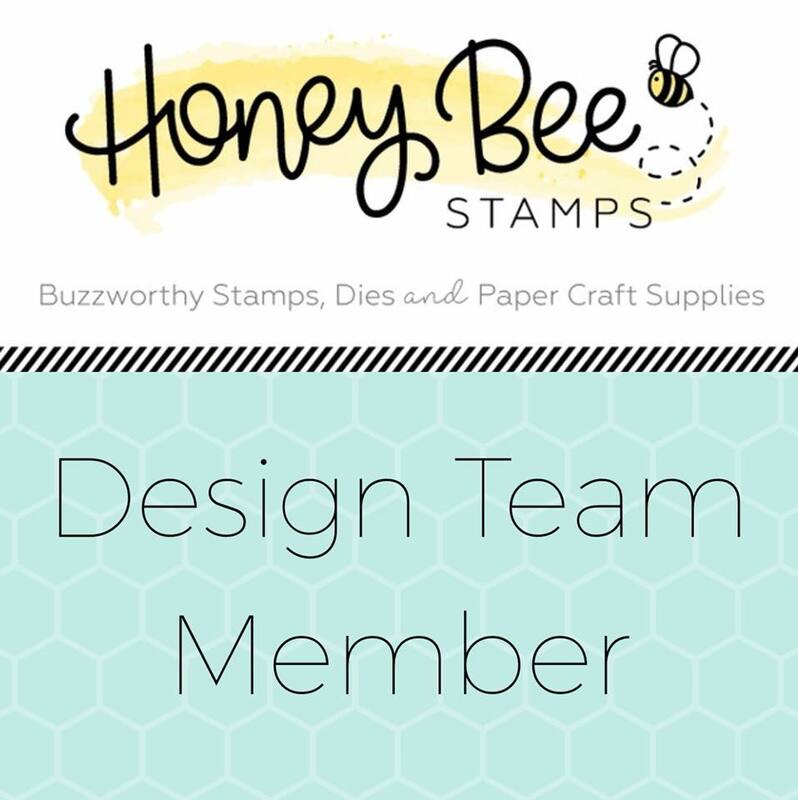 Then, I received an email from the Jennifer McGuire regarding my recent Hero Arts card that was published on Create Stamping. I basically get several stamps from my wish list being taken off the list, thanks to Hero Arts publication incentive program. I thought I'll get one free set and I am already happy about that. But several?? Oh gosh, I was busting the dance move in front of hubby after I ran up the stairs yelling to let him know. ;) LOL... Hubby call it happy stamp dance. I organized all the stamps right away and only took out the ones that I need to use for my DT assignment, so I wouldn't feel overwhelm. Then, I received beautiful images from A Day For Daisies for my DT works. All in one afternoon. And, suddenly I just felt like crying. I mean, literally my heart feels like it could burst and I was filled with so much gratefulness. It was such a strong feeling. Truly, card making has brought me so much joy this past year. I meet some fabulous, kind, & sweet new friends, I get to work with generous companies, I get do what I love, and I get to work with beautiful images all the time. How can I not but take a moment and say a prayer of thanks for all these blessings. Then there is you, who chose to follow my blog. When I lost my foster dad in March, you all keep me in your prayers, when I lost my job in April you send me encouragement notes, when I received great news about DT, you celebrated with me. So thankful for all of these. For this reason, I feel the need to express the gratefulness that I feel in my heart. I know, many of these things are just small things. But they are small things that fill me with so much gratitude. It's an amazing feeling and I thank you all for being part of it all. And, special thanks to my mom, hubby, and brothers who always cheering me on. Who always believe in me. Oh goodness... I am all sappy again. Simply said grateful heart = joyful heart. You're still with me... reading this long post? Thank you. 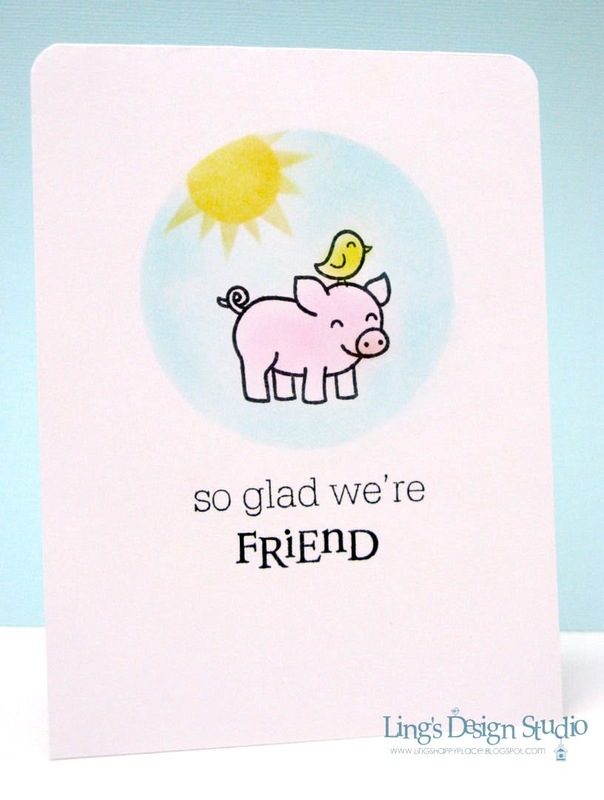 :) How about a card to end this long post? I wish you all many happy wishes. May your days be filled with many things that fill your heart with gratefulness. Hugs. Hi peeps. Sorry for being late with my Lawnscaping post today. I had internet connection problem and had to call my provider technical support. Phew.... luckily they were able to fix it. Let's get moving, shall we. This time we have "One Layer" challenge at Lawnscaping sponsored by Jenny Bowlin. 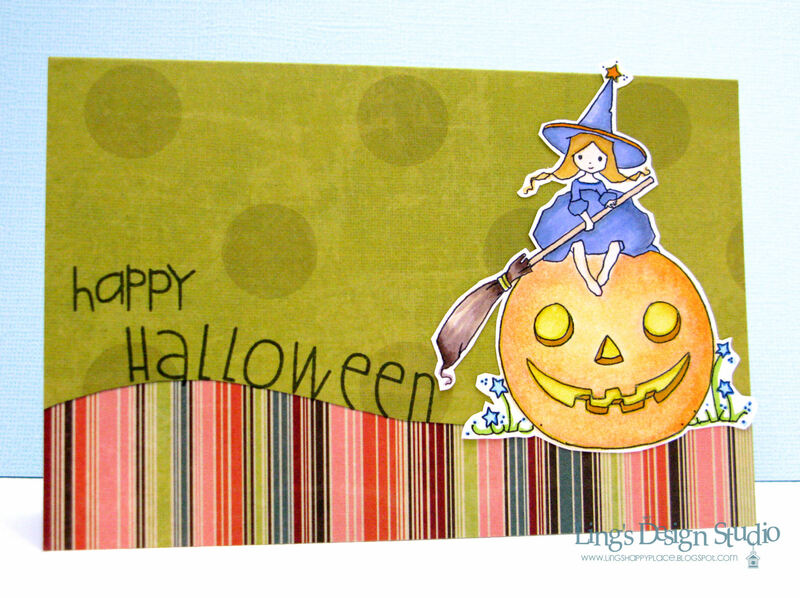 And here's my one layer card using the masking technique. 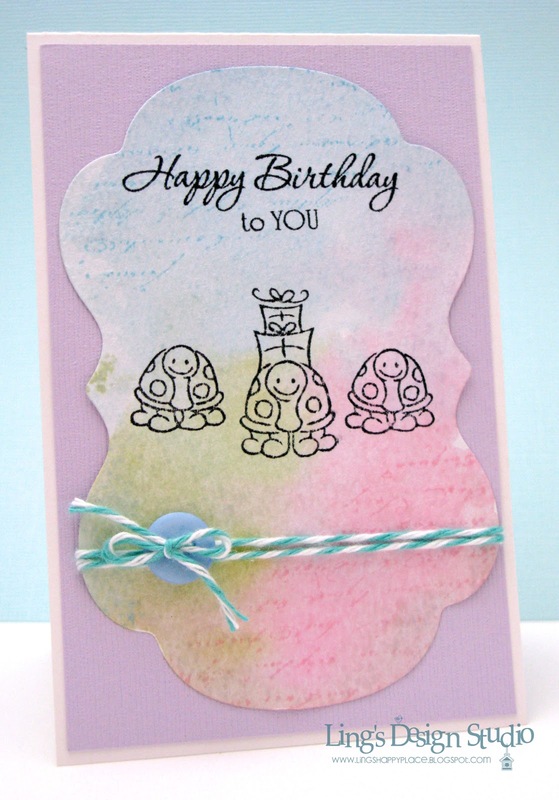 I cut a circle on a post it note, layer it on top of the card, stamp the images, then colored them in with chalks. For the sun, I punch out a small circle, cut a few triangles for the sunrays for masking. I hope you will join us for this super fun challenge. Check out the DT fabulous samples at LAWNSCAPING. 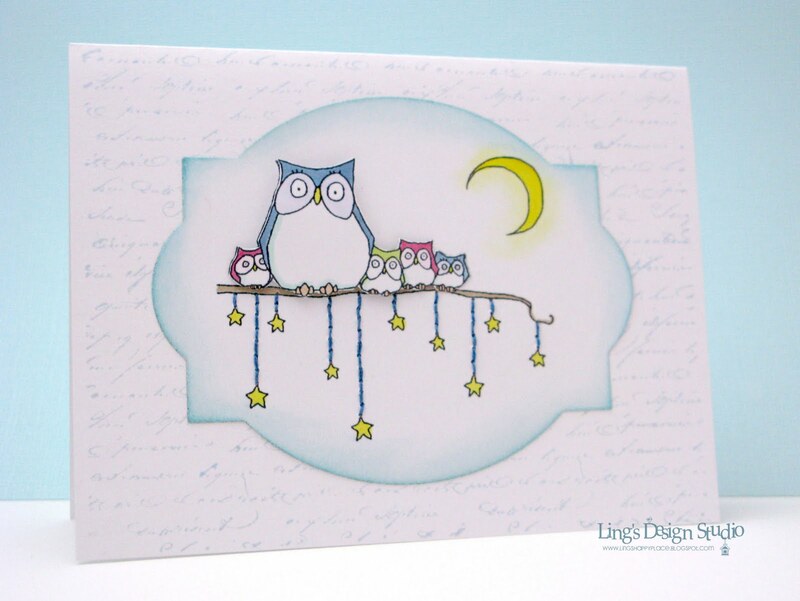 This past weekend, I did get creative and I made this card for CASE challenge #52 and I am casing THIS card by Tui Nathan. Her card was actually inspired by Teneale Williams card, but I was inspired by Tui's use of the yellow color. I don't play with the color yellow often, but her card inspired me to do so. 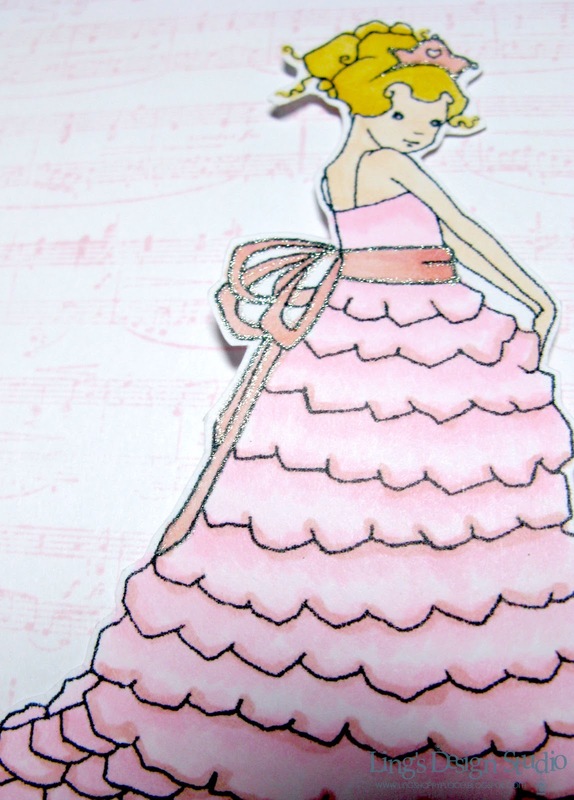 BTW, have you received Paper Crafts Card Ideas for Paper Crafters?? It's fabulous. Loads of inspirations. And, yep.. yep.., yours truly have 1 card published in there. :) Here's a look at the card that I made following one of the sketch. It's a pull out card. Thank you all so much for stopping by. Hope your week start off great! 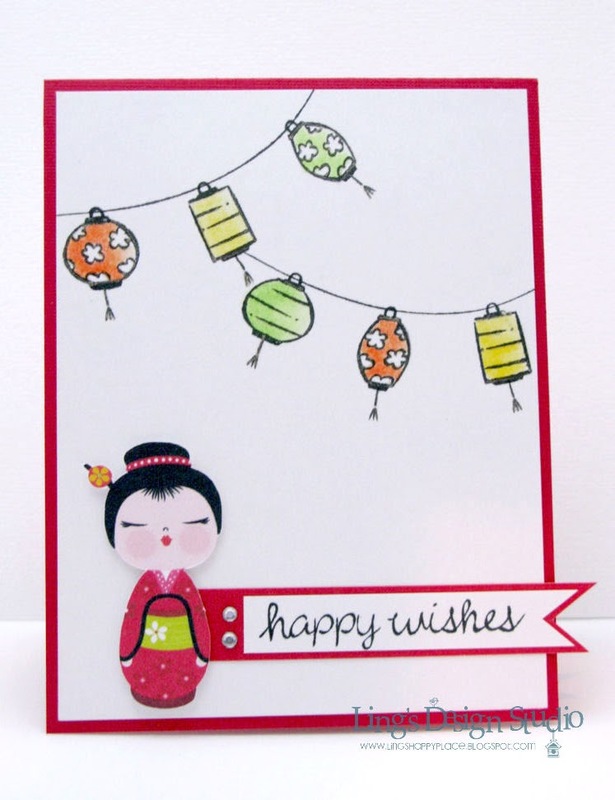 Hi and welcome to Denami mini cards blog hop! Glad you can join us. If you get here from LINDSEY then you are on the right track. As always, if you miss any link or want to start at the beginning, you can find a complete list of the participants at DENAMI blog. I had so much fun making mini cards for this blog hop. 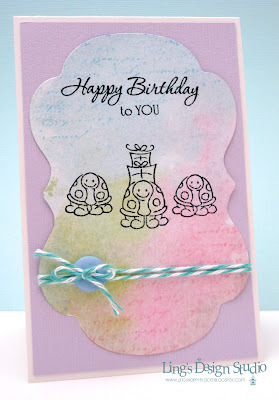 With Denami small size stamp, I find it very easy &amp;amp; fun to make mini cards. In fact, I had so much fun that I made a set of card and 1 extra card. Here's a look at the set one. 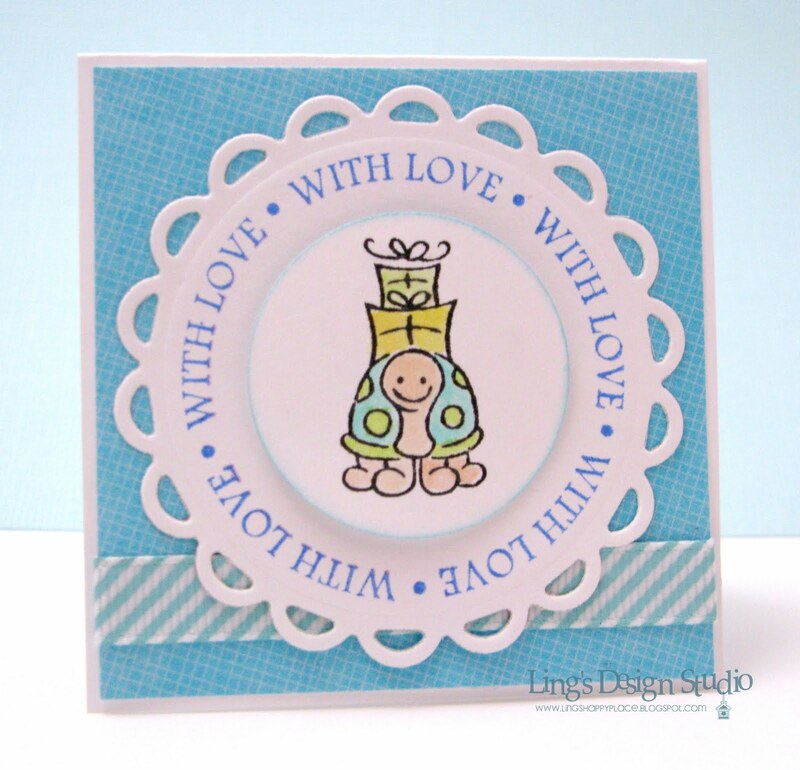 I love the circle sentiment and it fit perfectly inside the Spellbinders Nestabilities dies. I colored each turtles with ZIG Clean Color Real Brush (watercolor markers) and the waterbrush pen. Yep, I mentioned these markers quite often lately, because I am loving them at this moment. So easy and quick for coloring and no mess!! I still shake my head that I didn't get the waterbrush pen sooner. And the presents were outlined with Wink of Stella markers. Gorgeous fine glitters, it just hard to take pic of it. But in real life, these cards has some pretty glitters to it. The blue and pink background papers are from Echo Park digital. Hope you enjoy your visit here and find some inspirations. From here please hop on over to AYANA blog. Her cards always so cute &amp;amp; cheerful and I am sure she has something amazing for today's hop. Thank you so much for stopping by here and have a great Sunday everyone! 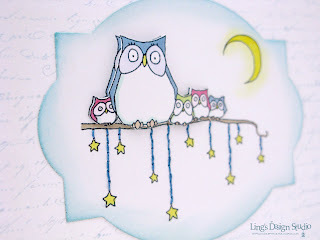 Hi everyone and welcome to August Wee Memories blog hop. If you arrive here from sweet STEPHANIE then you're on a right track. I am the last one on the hop list and the hop begins at JENNY. This week our challenge theme is "masculine card" and we are sponsored by Graphic45. Winner will received Graphic 45 stamp & papers. Masculine card for me always a challenge. See when it comes to hubby & my brothers I stick with cute or silly. Never super manly card or serious looking one. I came up with this one. Still kind of silly with the googly eyes. I think it looks cute when the eyes get stuck like as if they're looking up, thinking. But try as I might when it's time t take the pic, I couldn't make it back to that position again. I do love my Silhouette. That li'l machine is just so awesome. Glasses and mustache are from Silhouette. The sentiment is from Technique Tuesday. I love all Ali Edward's design and I scored a couple sets from Archivers stamp sale this past Monday. You have quite a few blog to hop to, so I keep my post short. Thank you so much for playing with us at Wee Memories and I hope you will join us for this challenge. You have 2 weeks to play. Have a super duper fun weekend! This is my first publication with them and here's a look of my card in there. After this one I haven't had much luck with my submissions to them. But, like Dori from Finding Nemo said... keep on swimming, keep on swimming... (now is that mantra stuck in your head?? LOL, cause it's been stuck in my head lately). Yes, I will keep on submitting and hopefully will get lucky again. 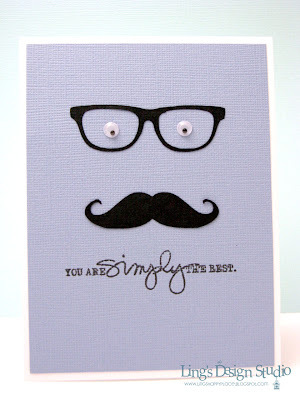 I also have a card to share with you. This week Tammy the owner of A Day For Daisies let the DT pick whichever image we want from the store and I chose this sweet image called "Mum Fairy". I love how ADFD image has that soft and delicate look and yes, the angel and fairy ones are some of my favorite. 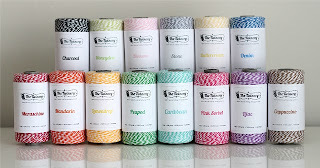 The gorgeous ribbon is from May Arts from their solid wrinkle ribbon collection HERE. To create the soft coloring I used ZIG Clean Brushable markers (watercolor marker), except for the vine & the haird, I used Copic. I do like to mix and match color medium. The edges of the die is distressed with distress ink. That's it for today and I'll be back tomorrow with new challenge from Wee Memories. Enjoy your day and stay cool! 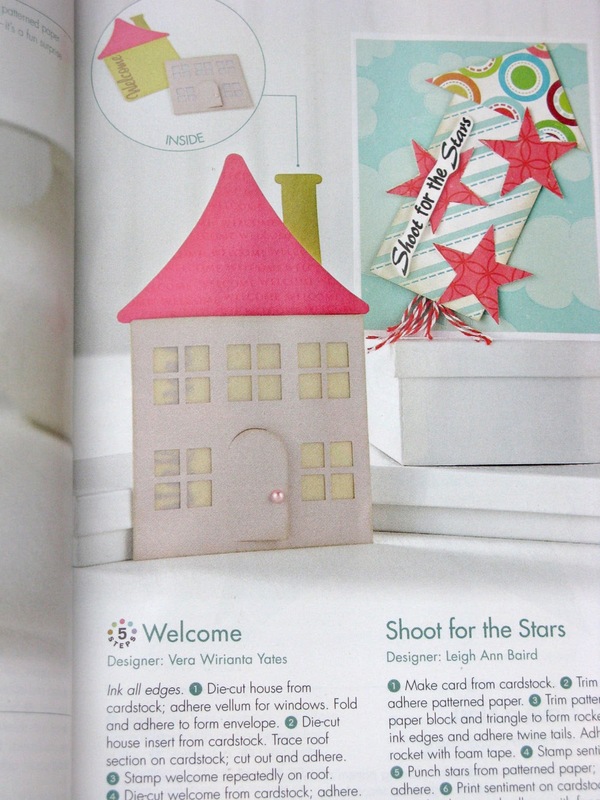 PS: Almost forgot, hubby picked the random winner for the Paper Crafts magazine. I wrote down all the name and the lucky gals is..... Laurel B! Congrats Laurel!! Yes, you rock! Seriously, the card making industry is seriously filled with nice people. 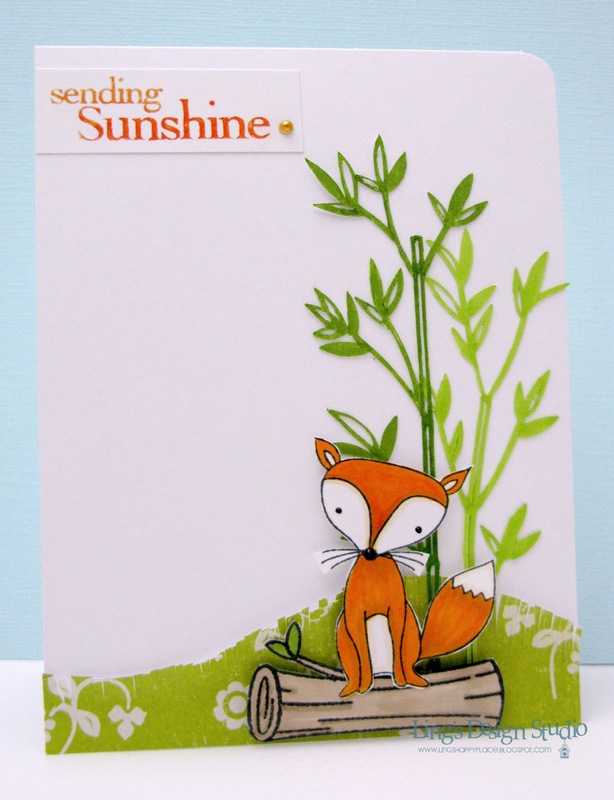 I want to thank everyone so much for your cheers & encouragement regarding my news on designing for PSA Essentials. From here, to twitter, email, and Facebook, thank you from the bottom of my heart for sharing my excitement. I am very touched by everyone kind words. All I can say is thank you. 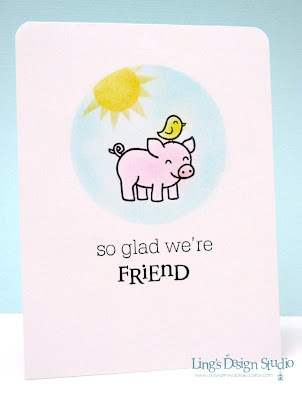 Okay, before I get all sappy, let's move on to card, shall we? Today, we have a new fun challenge at Some Odd Girl blog which is "Complimentary Color Challenge"! Your choice on the pair but the scheme must be complimentary. Not sure what that is? Its two colors opposite on the color wheel. Like Yellow and Purple. You can use different shades but they must be complimentary and in that set. That doesn't count for skin and hair colors. 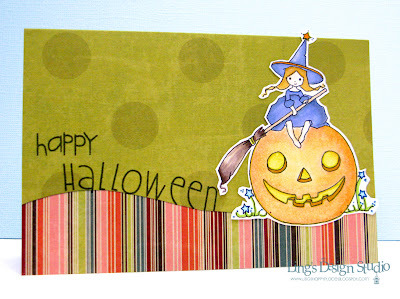 Here's my card using yellow-green and red-violet. 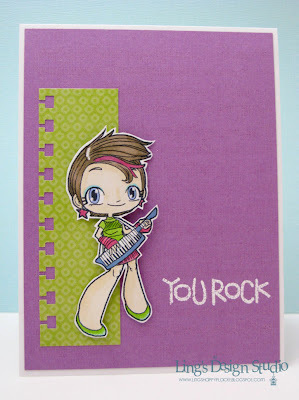 This is for all of you, because you all ROCK!! :) For this super fun color combo, I decided to use Punk Kaylee. I love her cute look and I thought a bit of pink on the hair would make her looks more rock-n-roll. What do you think? I am so inspired by the fabulous girls on SOG team. Their coloring skill is just amazing. Check them out and see it for yourself. 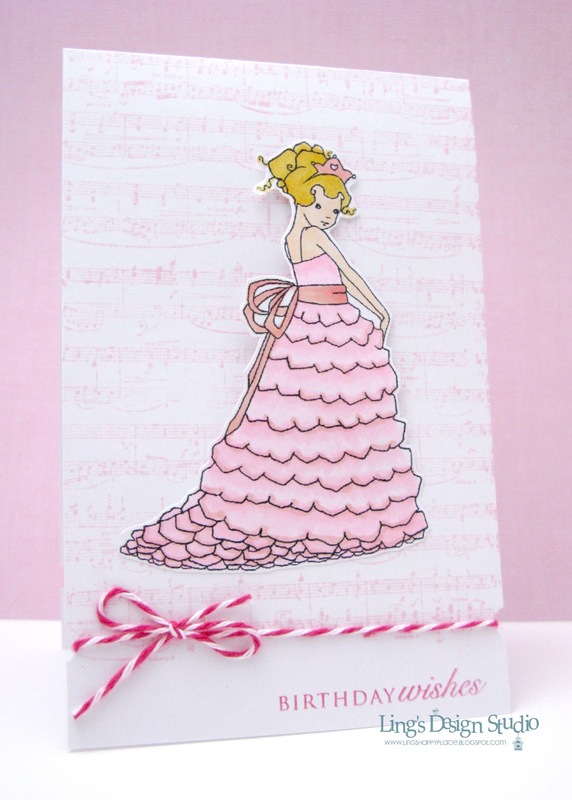 Find the fabulous cards by the girls HERE.